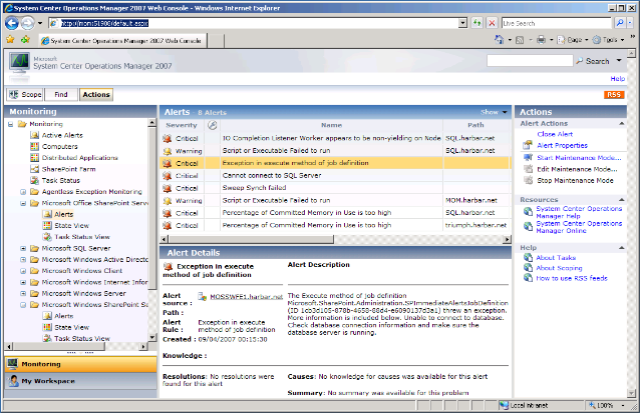 System Center Operations Manager 2007 offers many new and significantly enhanced features for providing operational service management of your SharePoint farms. Of note are the vastly improved deployment, reporting enhancements and PowerShell integration. In addition Audit Collection Services has finally shipped in this release after nearly three years of promises. While Operations Manager 2007 is an essential part of your SharePoint infrastructure, it doesn't ship with Management Packs for SharePoint 2007 and this version also introduces a new Management Pack file format. This means the Management Packs for SharePoint 2007 (released in January) are not compatible and require conversion to the new format. This is a two step process, first using the MP2XML tool in the Operations Manager 2005 Resource Kit, and then the MPConvert utility on the Operations Manager 2007 CD. That's no biggie in itself, but the problem is you must do the first step on an Operations Manager 2005 server, which is real hassle if you are in a nice clean new environment. You really don't wanna be building extra boxes just to get your management packs for SharePoint operational, so to save you the trouble I've converted the files and made them available here. Let's hope Microsoft re-release the packs in the new format soon. 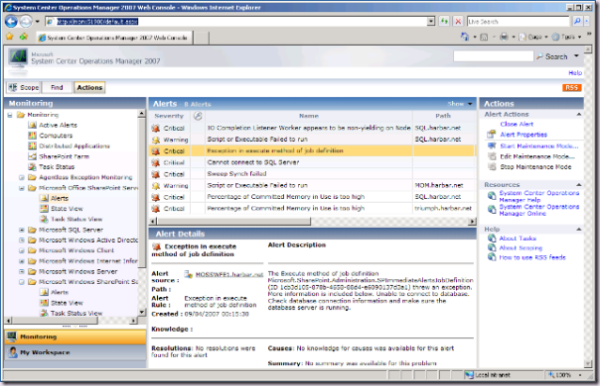 Download: Operations Manager 2007 Management Packs for WSS v3 and MOSS 2007. Another interesting tidbit about Operations Manager 2007 is that the Operations Console's Action Pane includes direct links to short webcasts about tasks related to your selection. This would be a great way to provide user assistance, say in SharePoint Central Administration. Also check out the top right of the Web Admin Console above - that's an RSS button that is (strangely not the new standard icon). RSS feeds - this is simple way to integrate health information into SharePoint Central Administration by adding RSS Viewer web parts (which you will have to procure because the OOTB one doesn't support authenticated feeds). There is opportunity here for a "mash-up" user interface for farm management ala Universal SharePoint Manager, who have a 2007 version in the works and nearly ready to go.